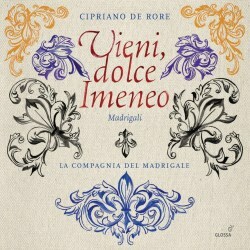 We have been fortunate that of late the madrigals of Cipriano de Rore have at last been appearing on CD in good quality and interesting recordings. He was considered, in his day, to be a supreme master even when only in his 30’s, was amazingly prolific and as Marco Bizzarini reminds us in his booklet essay, Monteverdi owed (even declaring it publicly) a great deal to him, although Monteverdi was born two years after Rore’s death. Of these recent recordings I was very positive in my review of Capilla Mediterranea’s Ancor che col partie disc (Ricercar RIC355). I still enjoy a 1992 recording of The Consort of Musicke’s CD of Rore’s Fifth Book of Madrigals of 1568 on the deleted Musica Oscura label. I was less positive recently about Graindelovoix’s Portrait of the Artist as a Starved Dog (Glossa GCD P32114), which had seventeen madrigals from various books, exclusively of settings from Ariosto’s huge poem Orlando Furioso. It’s true to say however that Rore’s sacred works have been more thoroughly explored and you might know the wonderful Brabant ensemble’s recording of the Missa doulce Memoire on Hyperion (CDA67913). I heartily welcome this newcomer however and will delve deeper into its content. Rore, along with his possible teacher Willaert, pushed the boundary areas to unheard-of, audacious chromaticisms. They invented chromatic melodies proceeding in semitones throughout and wrote chromatic harmonies in strangely modulating passages. Gesualdo continued in this vein later in the sixteenth century. No wonder then that when Monteverdi was criticised for his daring harmonies he cited Cipriano de Rore as the respected instigator. The notes mention certain pieces which are especially expressive in this regard for example in the final track, ‘O morte,eterno fin’ and ‘Por che mi invita Amore’. The poets credited include Petrarch, from his Canzoniere, Ariosto from the ubiquitous Orlando Furioso and the Florentine poet Giovanni della Casa, who died in 1556. The madrigals, as listed below, are from Rore’s outstanding later collections of 1557, 1566 and posthumous publications of 1570, either for four or five voices. And La Campagnia has chosen well, with some of the most superb pieces from these dizzyingly brilliant publications. If occasionally the singers have overlooked precision of tuning in favour of passion and expression, then I’m all for that. These performances are as good and as thrilling as you will hear on any disc of this repertoire. I have played over ‘Sebben il duol’ and ‘O sonno’ several times, largely in admiration of how the text is subtly and movingly worked into the counterpoint and harmonies. It is highly sophisticated, refined and sensitive. Three madrigals are performed in slightly different ways with two voices and instruments playing the remaining parts. These are less satisfactory as performances but are beautifully sung and played especially ‘Alcun non può saper’. The title of the disc ‘Vieni, Dolce Imeneo’ is a wedding madrigal the opening of which is translated in the booklet as ‘Come Hymen, God and marriage’, celebrating the marriage of Alessandro Farnese and the Portuguese infanta Maria of Guimaraes in 1565, the year Rore died. And, as the wedding took place in Flanders near to the composer’s birthplace, it seems apt to regard this thoughtful work, which demonstrates much of life’s experience, its joys and sadnesses, as not only a suitable title for the disc but as one of Rore’s last great vocal compositions. The recording is close and almost intense, which is very involving, although recorded in a fine baroque church and the booklet is neatly and firmly attached within the cardboard casing as Glossa always does. The essay and general presentation are of the highest standards.